In 1926 MAGNASCOPE was by no means a new idea - but its creative use during the presentation of "OLD IRONSIDES" at the Rivoli favourably impressed the New York City picture-going public. Consequently Paramount, Fox and others, set off on the road to improving the concept, leading them into wide-gauge formats. This resulted in the ill-timed GRANDEUR-era of 1929/30. Most readers will be aware of the flurry of wide format activity in the late 1920s. But just what were the systems on offer, and how many titles were actually presented on wide gauge prints? There is quite a bit of vagueness and misunderstanding regarding this era which can be cleared up by a simple, carefully interpreted, reading of Weekly Variety from that time. 1907 had settled 35mm as the accepted standard for photography and presentation. Naturally, experiments in wide gauge, color, sound and 3-D continued. Sound-wise, the choice narrowed in the 1920s to optical sound-on-film or synchronized records. Warner's Vitaphone sound-on-disc system premiered in New York City on August 6, 1926 with the feature "Don Juan". On the widescreen front: Most active in the United States during the early 1920s were George K. Spoor and P. John Berggren with their Natural Vision process, while John D. Elms and George W. Bingham tinkered with their Widevision/Widescope technique. During a season of D.W. Griffith revivals in New York City's Cameo Theatre from November 7, 1926 a Widescope demonstration was presented with the program. 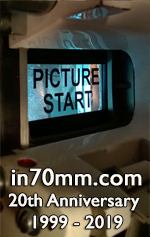 It appears to have involved 70mm photography with optically halved images for twin 35mm side-by-side projection. The system raised not a ripple of interest and was never heard of again. 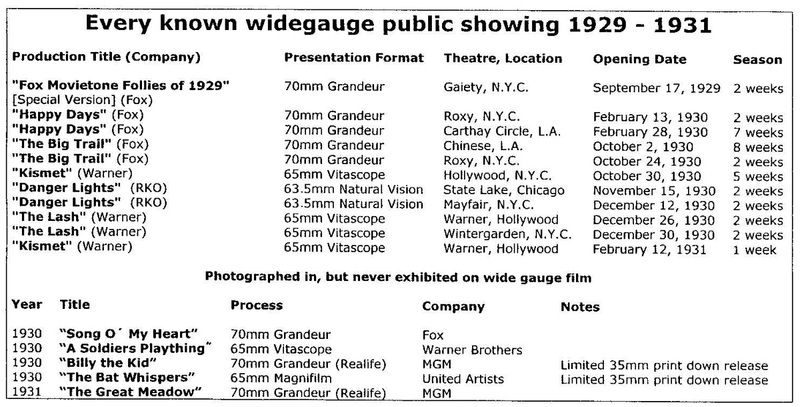 The first widegauge presentation of the era - September 17, 1929 at the NYC Gaiety. 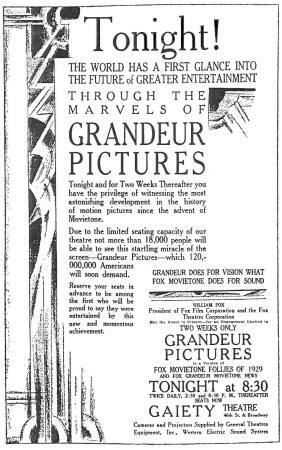 GRANDEUR is obviously the star of the show: For Two Weeks Only "Grandeur Pictures in a version of Fox Movietone Follies of 1929 and Fox Grandeur Movietone News"
Public interest in the big screen was raised just a few weeks later, however, when Paramount's "Old Ironsides" opened December 6, 1926 at the New York City Rivoli. At climactic moments during the presentation the operator changed over to a projector with a shorter focal length lens. This increased image size from 18x12 ft to 40x30 ft when the curtains had been fully parted and raised (The Rivoli's Todd-AO screen was 63x27 ft. in 1955). Careful examination of the enlarged image revealed that it was grainier, fuzzier and darker than the normal sized picture - but the public overlooks such technicalities when overcome by the excitement of the moment. Glen Allvine of Famous Players-Lasky is credited by Variety for this innovation "invented" by Lorenzo del Riccio in 1924 and christened Magnascope by Jesse Lasky. The public was impressed, so the technique was naturally repeated on other Paramount titles, like "Wings" (1927), and copied by other studios. In fact, the simplicity of the "technique" meant that any individual theatre, with a slightly creative operator, could use (or overuse) its dramatic potential. The first conventional feature shot in GRANDEUR "Song O' My Heart" was only ever shown in Standard 35mm. Ironically, it turned out to be the highest grosser of all the wide gauge productions of the period! Not wanting to be left behind, MGM had a team of engineers including Joseph Vogel and J.J. McCarthy, who developed the "Fantom Screen". Although the name was soon lost in time, the technique lived on, being a simple improvement on MAGNASCOPE involving an adjustable lens, allowing the enlargement and reduction of image size to take place without the need of a projector change-over. (Some sources claim the process also involved moving the screen towards the audience on rollers - this may have given a thrill to those in the front few rows but others in the theatre are unlikely to have noticed). 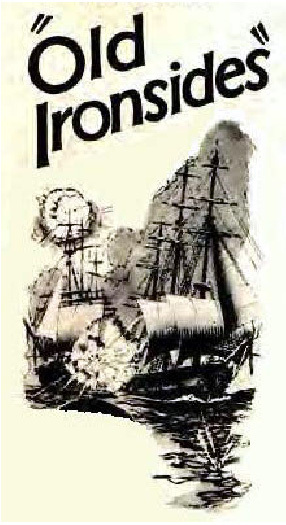 "Fantom Screen" was first used on "Trail of '98" which opened at the New York City Astor on March 20, 1928. Paramount took the next big step towards widescreen with their Magnafilm process - developed by Lorenzo del Riccio of Magnascope fame. The film used was 56mm wide, which was determined to be the widest gauge that could be accommodated on a standard 35mm projector without major modification. Frames were the normal 4 perfs. high and the image aspect ratio was 2.18:1. 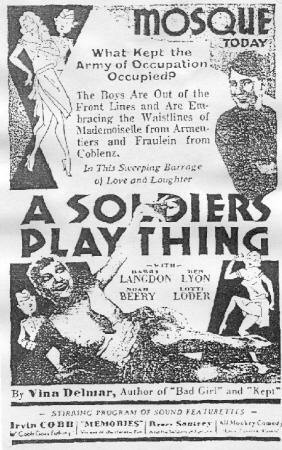 Paramount produced a short subject in this process - "You're In The Army Now" featuring Johnny Burke - which was shown to an invited audience at the New York Rivoli on July 18, 1929. Screen size was approx. 40x20 ft (This short should not be confused with similarly-titled features). Fox put a major promotional effort into their first conventional 70mm release. 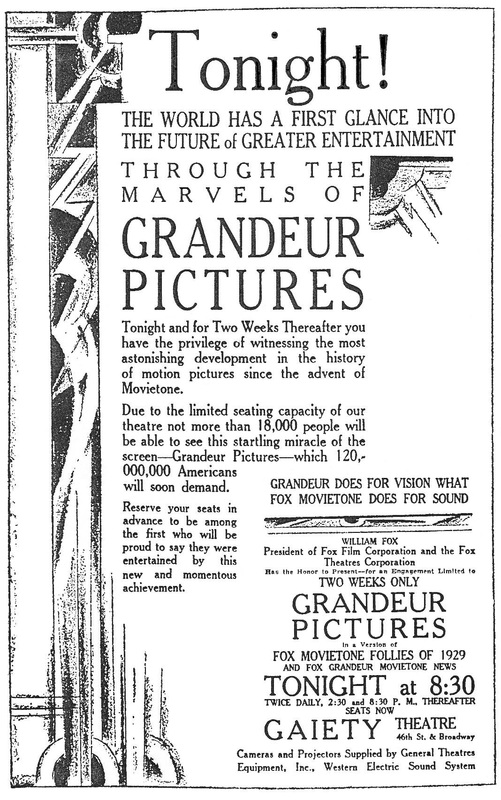 GRANDEUR was heralded as a natural progression - '1896 moving pictures, 1927 Movietone talking pictures, 1928 Movietone newsreel, 1930 the first film written, produced and projected on GRANDEUR Pictures' "HAPPY DAYS"
Lack of interest resulted in this process being dropped without public exposure. Paramount turned their attention to 65mm, but this system - and Universal's proposed 65mm Magnachrome format-similarly failed to reach public scrutiny. It takes drive, determination and money to launch something a bit revolutionary. 20th Century Fox had great success with their bold introduction of CinemaScope in 1953. Not so successful was William Fox, owner of namesake Fox Films, who decided - 25 years earlier - that an industry in turmoil, adapting to sound and dallying with color, needed a new wide film format as well. 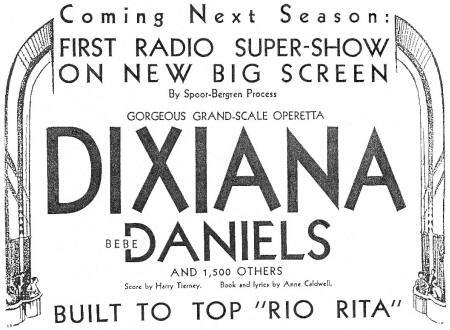 This RKO trade advertisement (in Variety January 8, 1930) promises "Dixiana" as a 63.5mm NATURAL VISION production. (It was eventually produced and released in Standard 35mm only). Exhibitors were cool about his 70mm Grandeur plans, but although other productions companies resisted the move to wide format, most felt they couldn't be left behind in case Fox knew something about the whims of public taste which had escaped the notice of their marketing departments. Having made the decision to "try wide", there was very little agreement on the appropriate width and format. "The Big Trail" was Fox's 3rd and final attempt at achieving GRANDEUR acceptance. Its World Premiere run at Grauman's Chinese in LA was 8 weeks, the longest of all the wide film releases of this era. Sadly, despite many ingredients for success, it was a boxoffice disappointment (and John Wayne had to wait another 10 years to become an international star). The result was 11 features, released by 5 different companies, in 5 different widescreen formats, from late 1929 to the end of 1930. The wide film derby started at the Gaiety Theatre, N.Y.C. on September 17, 1929 with the Grandeur presentation of a specially filmed version of "Fox Movietone Follies of 1929" featuring sequences thought worthy of large format shooting during production of the 35mm version (released earlier that year). The supporting program included "Fox Grandeur Movietone News" and views of "Niagara Falls". Earl I. Sponable (of later CinemaScope fame) developed the Grandeur format. It used a specially designed 70mm Mitchell Fox camera, four-sprocket hole frame, a wide optical soundtrack, and an image aspect ratio of 2,13:1. 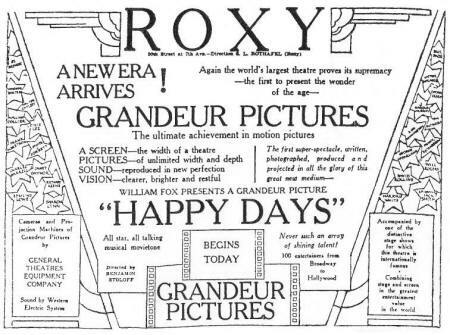 Screen size at the Gaiety was 35x171/2 ft. Six weeks later Variety reported the collapse of the stock markets with the headline "Wall St. Lays an Egg", but wide films continued regardless. "Cisco Kid" was suggested as Fox's first major Grandeur release feature, but in fact is was to be "Song O' My Heart" which went into production on November 11, 1929. Warner's first 65mm VITASCOPE production was "A Soldiers Plaything" (1930). The finished product was found wanting, so they baulked at a widegauge launch. It went into a quiet Standard 35mm release. 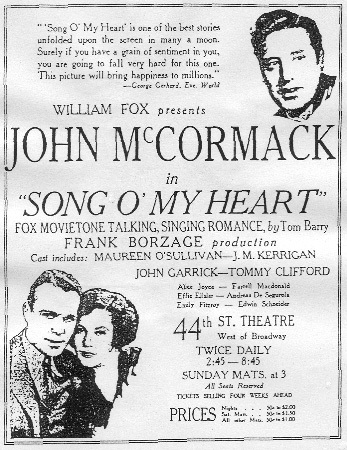 When completed, Fox management deemed this John McCormack Irish musical inappropriate for a Grandeur release. The standard 35mm version opened at New York's 44th St. Theatre on March 11, 1930. 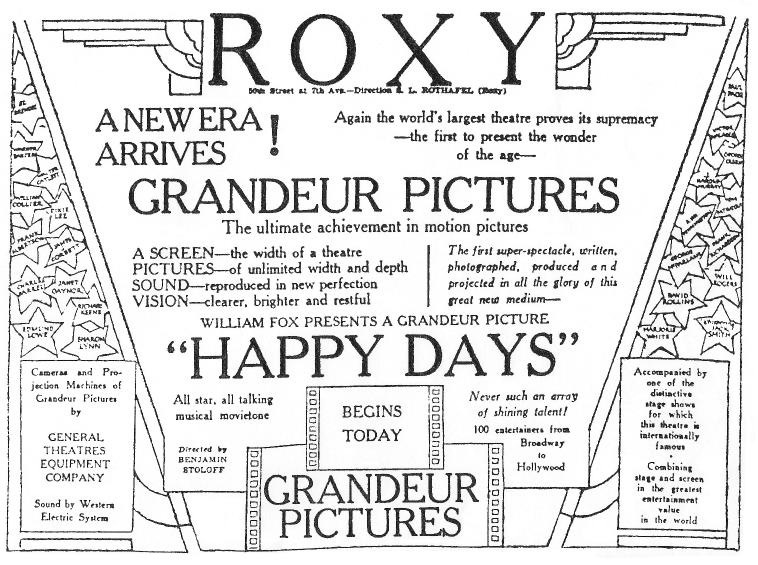 "Happy Days" also ran in Grandeur at the Carthay Circle Theatre in Los Angeles, opening February 28, 1930. All subsequent big city openings of this film were in standard 35mm (Despite some contrary claims, I believe all 11 wide film titles of 1929/30 were filmed simultaneously in standard 35mm versions). Fox was apparently less than "happy" with public response to their first Grandeur feature. 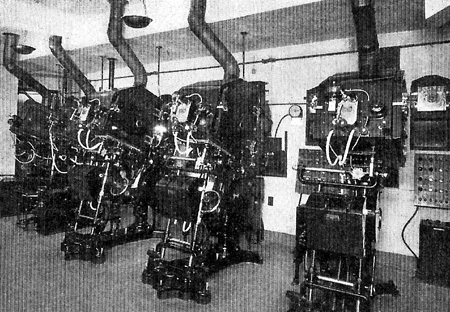 In March the five Grandeur Movietone News Units, set up the previous December, were reassigned to 35mm duties. When Warners did eventually try a VITASCOPE presentation, they showed little interest in promoting the fact. 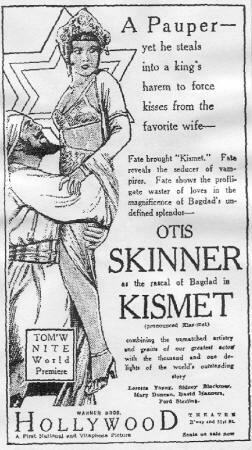 No advertisements in the New York Times for the World Premiere run of "Kismet" (1930) made any reference to its wide gauge release. Despite Fox's dimmed enthusiasm, wide film announcements by other major studios had begun in earnest - MGM, Warner, RKO, Paramount, Universal and U.A. were all on the bandwagon. RKO signed up with Spoor/Berggren for their 63.5mm 1,85:1 aspect ratio 6 perf. frame Natural Vision process. 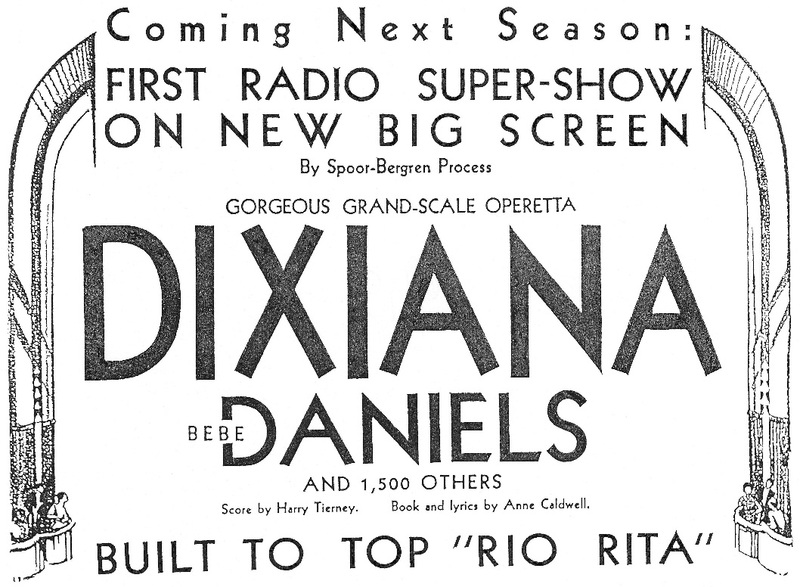 "Dixiana" was set to roll in February 1930, but ended up as a conventional 35mm production. Warner Brothers planned to film "Life of the Party" in their 65mm Magnaframe process starting May 1, 1930 (lt was shot in Standard 35mm Technicolor instead). In March 1930 Paramount dickered with the idea of re-filming the silent "Light of the Western Stars" in 65mm (It didn't happen). "The Bat Whispers" (UA 1930) was the only film ever shown in MAGNIFILM. (This NYC advertisement misspells it 'MAGNAFILM'). It was shot on 5-perf. 65mm film and Standard 35mm. In April 1930 MGM started production on "Billy the Kid" using the 70mm Mitchell F.C. 's (Fox cameras), while Douglas Shearer experimented with reducing the Grandeur image to 35mm (It was reported that Fox had figured out how to do this the previous October). MGM dubbed their resulting format Realife. The 2,13:1 aspect ratio 70mm picture is reduced to fit between the perfs of standard 35mm film (with a resulting large gap between images). It was planned to show the films on double width screens using discs for sound reproduction. (The same principle for obtaining high quality 35mm images from a large frame negative was also applied 24 years later in Paramount's VistaVision technique). In 1930, October to December was to be the frantic period when all 5 wide film systems jostled for attention. (Actually the majors had all but given up on wide film production by now, and the promotion of their big screen techniques displayed limited enthusiasm). 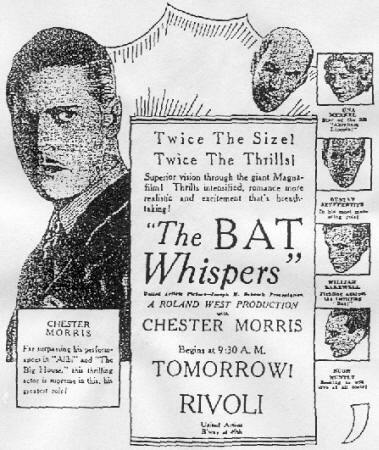 Trade advertisement for "The Bat Whispers". Its 'presenter' Joseph M. Schenck was later involved with the launch of TODD-AO which was developed using the same cameras. "The Big Trail", Fox's Grandeur western epic, opened at Grauman's Chinese in Hollywood on October 2, 1930 with the Roxy, N.Y.C. following on October 24. 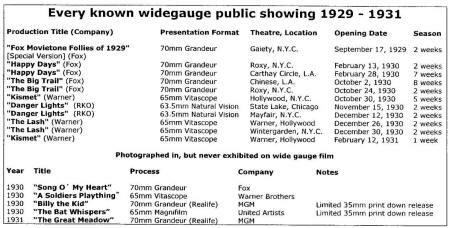 These were the only 70mm presentations, although 35mm Grandeurscope print downs seem to have been used in some venues. Fox had high hopes for this picture, but box-office results were generally below expectations. Metro's "Billy the Kid" opened almost simultaneously at the Paramount Theatre, Detroit (on October 16) in Realife. Other Realife (35mm) showings were at the Capitol N.Y.C., Oriental Chicago, Aldine Pittsburgh, Fox Atlanta, Stillman Cleveland, State Providence, Midland Kansas City, Columbia Washington D.C. and Criterion, L.A. In June 1930 it had been revealed that Warner Brothers had invented their own 65mm 5 perf. frame system (Aspect Ratio 2,05:1). Development engineers were Frank Murphy, Fred Cage and Al Tondreau. The following month 65mm "prologues" were due to commence screenings at the Warner Hollywood. "Danger Lights" (RKO 1930) was the first and only feature ever produced in Spoor/Berggren's unique 6 perf. 63.5mm NATURAL VISION process. This advertisement 'as if they stepped from the screen to meet you' fails miserably in achieving their aim of conveying the 3 dimensional depth claimed for the result. The first Warner Vitascope feature - Harry Langdon´s "A Soldiers Plaything" (1930) was deemed unsuitable for wide film launch. It opened quietly in standard 35mm later in the year. "Kismet" brought Warner's hesitantly into the widescreen era. It opened October 30, 1930 at the Hollywood Theatre, N.Y.C. for a disappointing run, during which no mention was made in advertising of its Vitascope large screen presentation. Twelve other 65mm openings in the US had originally been planned for this film. (Twelve theatres per title were the limit agreed by studios in their efforts to prevent the widespread adoption of wide film). Warner's used sound on disc for their Vitascope system as they were still claiming the reproductive superiority of the technique at this time, but they left space on the film for an optical soundtrack. A few days after Vitascope appeared Magnifilm arrived with a preview of United Artists´ "The Bat Whispers" at the Wilshire Theatre, L.A. on November 6, 1930. Mystery still surrounds the identity of the camera used for this production. The negative is 65mm wide with 5 perforations per frame, basically the same as Vitascope and virtually identical to today's Todd-AO. Most money is on Ralph G. Fear's Fearless Superfilm Camera - but we await indisputable evidence. [UPDATE: More evidence to confirm this has since come to light]. In any event Magnifilm, just like Realife, was never presented on wide gauge film. All wide format presentations of "The Bat Whispers" used 35mm reduction prints with an optical soundtrack on the same film. 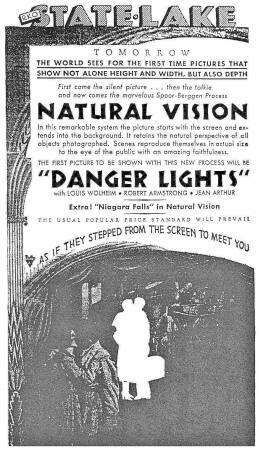 A few days after the bat first whispered, the fifth wide format emerged with RKO´s "Danger Lights" (And another Niagara fall short subject, this one in color tone/tinted) presented in Natural Vision at the State Lake Theatre in Chicago on November 15, 1930. The 63,5mm picture film ran at 20 f.p.s. while the sound was carried on a separate 35mm film at 24 f.p.s. The screen was 46x27 ft. The only other showing of "Danger Lights" in wide format was a few weeks later at the Mayfair, NYC from December 12, 1930 using the same projection equipment. Last of the biggies - "The Great Meadow" was Metro's second and final GRANDEUR production. It was never shown in 70mm anywhere, and there's no sign of REALIFE either. ('No racketeers' in the advertisement refers to the over abundance of crime melodramas on release at that time). This short-lived wide film era had its last gasp on December 26, 1930 when Warner's "The Lash" (Working title "Adios") opened simultaneously at two Los Angeles theatres. The downtown Warner (Pantages Mark II) ran it in 35mm standard format while the 65mm Vitascope version was shown at the Hollywood Warner. The idea, naturally, was to determine whether people would be drawn to the wide version. However, as the theatres were many miles apart and little effort was expended in extolling the virtues of the Vitascope format, it is hardly surprising to discover there was no appreciable difference in business at the two theatres. Just before years end on December 30, 1930 "The Lash" opened in New York on the Vitascope screen at the Wintergarden. For all intents and purposes this initial wide film era had come to a close. 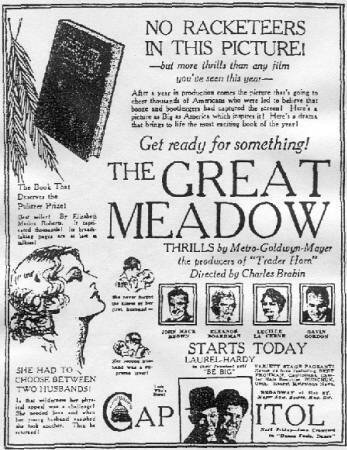 Metro's second and final 70mm Mitchell Fox Camera production "The Great Meadow" opened at the New York City Capitol on March 13, 1931, but no mention was made of Realife presentation - its seems to have been shown in standard 35mm. So by the end of 1930 all was lost - the studios had lost interest in wide gauge and William Fox, who started the scramble, had lost his studio. 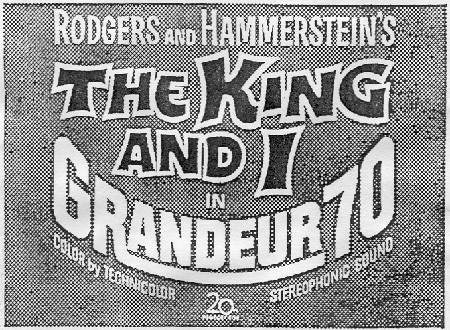 The 1961 70mm printdown re-release of Fox's 1956 "The King and I" (filmed in anamorphic CINEMASCOPE 55) was advertised as GRANDEUR 70. Well, they all went into storage for 23 years or so until Cinerama awakened interest in wide formats again. 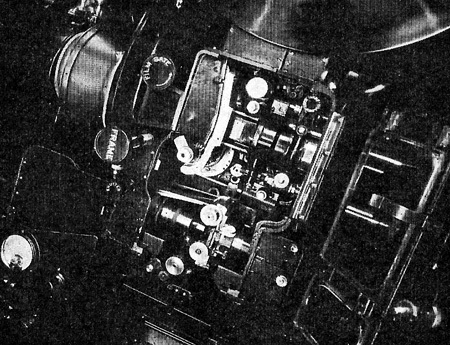 Early Todd-AO cameras were Fearless Superfilm units, while both Camera 65 (Ultra Panavision 70) and CinemaScope 55 initially involved converted 70mm Mitchell Fox Cameras. (It was not for no reason that the 70mm reissue of "The King and I" was advertised as Grandeur 70 - a nice nostalgic touch). Why didn't the Magniscopic Grandeur of Realife Natural Vision catch on? Well, apart from the fact that enough technical challenges were already being presented to the industry by the introduction of sound, the simple fact was that wide film offered little but extra expense for producers and exhibitors. Images were black and white; sound was monophonic and not much better than standard 35mm format quality. At the time large images were also being offered by lots of theatres using short focal length lenses on conventional films. Sure - the image quality of the large gauge was better - but was it better enough? Obviously not. The world would wait for a wide screen, which matched superior image quality with natural color and high fidelity directional sound. Those ingredients came together - on September 30, 1952 when "This is Cinerama" launched the wide film era which continues to this day. Metro's first wide production was "Billy The Kid" (1930) photographed using the 70mm Mitchell Cameras designed for Fox's GRANDEUR. All REALIFE showings utilized 35mm prints with wide format images printed down from the original 70mm negative. International note #1: There is no evidence that any of the above wide format productions were ever shown in large gauge outside the United States. 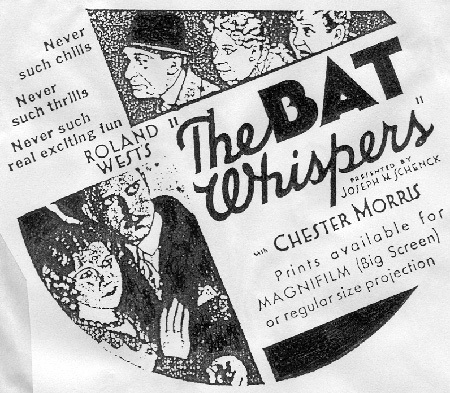 However, "The Bat Whispers" for example, was certainly shown (For a season from April 4, 1931) at the London Regal using the wide format 35mm print-down version. International note #2: Chretien's late 1920s anamorphic experiments and Gance's Polyvision ("Napoleon" April 7, 1927) created little interest outside France at the time - but of course 25 years later the French Anamorphoscope came to Hollywood's rescue as CinemaScope. The Grandeur sprocket holes were larger and set further apart than normal. This means that Grandeur 4 perf. frames were nearly the height of those on normally sprocket-holed film with frames 5 perfs. tall. Approx. frame dimensions: Grandeur 48 x 22,5 mm. Vitascope 46 x 23 mm. Todd-AO 49 x 23 mm. Sources: Weekly Variety, N.Y. Times, and numerous other publications including Widegauge Monthly. Thanks to John Mitchell, Peter Fraser, Dan Sherlock, and all the guys at rec.arts.movies.tech. Grandeur projector mechanism (at Carthay Circle). Photo from AMPAS publication "Recording Sound For Motion Pictures" edited by Lester Cowan (1931). Fox Grandeur 70mm installation at Fox Carthay Circle Theatre, Los Angeles (1930) for the seven week season of "Happy Days". Photo from AMPAS publication "Recording Sound For Motion Pictures" edited by Lester Cowan (1931).